I've mentioned before that I'd like to learn another language. To be honest, I've always been a bit envious of people who are bilingual. I know a little bit of Spanish, but I would really like to be fluent in it. On a recent trip to Europe, I regretted not being able to communicate well with the people I met. Most people spoke at least a little bit of English and I felt bad that I didn't speak any other language at all. So I thought I'd read Fluent Forever by Gabriel Wyner to see if it would help me. Gabriel speaks six languages and he learned them using the techniques he shares in his book. If it worked for him, it could work for me, right? 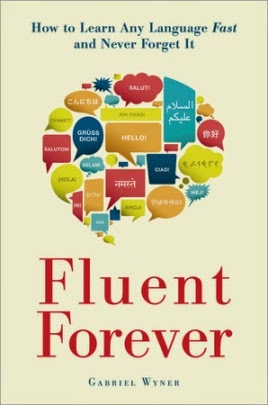 In Fluent Forever, Gabriel emphasizes that the process of becoming fluent in another language is more than learning a language, it's really about training your brain to think differently. He teaches you how to learn, not necessarily what to learn. He acknowledges the best way to learn a language is complete immersion, but certainly not everyone has that opportunity. His specific strategies for remembering foreign words, learning accents, and using grammar can be customized and can be done a few minutes a day. This is not a technical book. It's easy and enjoyable to read with plenty of personal anecdotes, which makes sense since the author believes that learning a language should be fun and enjoyable, otherwise you won't stay with it. Though it's not a technical book, it does offer specific things to do to learn a language such as new ways to use flash cards, creating connections with words for better recall, and using word frequency lists. Regardless of which language you are learning, Fluent Forever is a great place to start. Not only is it filled with valuable tips and information, but is also has many useful resources. Gabriel also has a website, Fluent Forever.com with even more information and resources. I'm trying to learn French right now. I'll check this book out. I'd love to speak French too, but I think I should master Spanish first!